TADHack is less than two years old. The first event was in June 2014 across Madrid in Spain, Colombo in Sri Lanka, Chicago in the US, Kuala Lumpur in Malaysia, Manila in the Philippines, and comfort of your own home (remote entries). Since that first event we’ve created over 200 amazing hacks, distributed close to $100k in prizes (mostly cash), and over 40 of those hacks are commercial or in the process of going commercial. This is an amazing achievement, TADHack works, but how is it possible? TADHack is made possible by the industry coming together, not by an individual company. No one has everything you need, most services are a mash-up. Comparing and contrasting is essential to making the best decision for your needs. TADHack is an open ecosystem. TADHack a grass-roots initiative of like-minded people from around the world working together. Its people with a common vision formed from working at the coal-face of the industry, not sequestered behind a non-customer facing role. TADHack is egalitarian, it doesn’t matter if you’re big or small. Note the small guys involved spend most of their marketing budget with TADS because we deliver. TADHack is about collaboration. 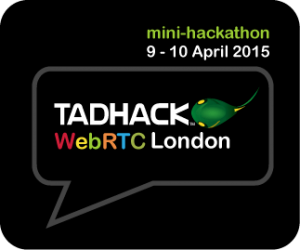 At TADHack-mini London we have collaborations with: Founders and Coders, London VoIP User Group, UCL, and the WebRTC Global Summit. This makes for an unique event of immense value for those involved. TADHack is focused on developers using the sponsors’ capabilities, not the sponsors. The sponsors win by having developers be successful on their technologies. We also have TADMentor to help people benefit from the amazing experience of the TADHack sposnors, we have cash prizes (so you can share the win with your family), we help and promote developers who get involved. TADHack is for Everyone – check out this weblog, married couples, industry renowned experts, newbies, designers, web developers, non-coders, people who just come to build confidence and realize just how easy service creations has become. TADHack has a balanced global and local approach. The democratization of telecom capabilities enables people to innovate anywhere, not just in the Bay Area. TADHack keeps it real, with no marketing BS, check out this weblog. This helps you focus on where you can make money. Big corporate initiatives like 4YFN are just window-dressing with people who are not hungry for business rather just keeping their easy-life corporate jobs. It really should be called 4 Years From Nowhere. At TADHack people involved are hungry, they want the business. And the model is such that it will always remain true, the people who get most out of TADS are not those with the biggest wallets its those who put in the most time because they want the business. Join us (either in person or remote) at TADHack-mini London, or in May at TADHack-mini Uruguay, or in Oct for TADHack Global, which will have 30+ locations running in parallel around the world. Being part of TADHack is well worth your while.